After much playing, testing, discussion and quite a bit of deliberation, we have finally settled on our three API champions. While [everyone did an amazing job on their applications](http://www.wufoo.com/2010/09/17/the-api-contest-submissions/), the following apps were the ones we felt had the best combination of usefulness, polish, and advanced API use. Our first place winner and battle axe goes to Pico! Pico is an iPhone app developed by Rick Blalock that’s designed for interacting with your Wufoo account while on the move. You can view all your forms in a searchable list, while seeing how many entries each form had that day. Tapping a form allows you to browse its entries, where you can view individual submissions (this is also searchable) or add a new ones right on your phone. Reports feature allows you to view data via our Chart, Number, Text, and Datagrid widgets. Since our graphs are done in Flash currently, you cannnot see the Graph widgets through Pico. Access to the the user accounts in Wufoo is also available through the UI to let you see each user’s access levels and email them for your convenience. Rick did a fantastic job in pulling in data from nearly every single API we created, including the Login API, which makes it much easier for average users to use the program without having to understand how to root out their individual API key. This little app is polished in all the right places and we’re sure our power users will love using it to interact with their data while on the go. Pico is on sale now on the [iTunes App store](http://itunes.apple.com/us/app/pico/id387567887) at an introductory price of $2.99. Tim Morgan takes our second place award for CSV2Wufoo, a web service that makes light work of importing and exporting your data from your favorite spreadsheet format into and out of Wufoo. Tim also deserves a blue ribbon for participation. He’s been working on CSV2wufoo for more than a year and had already iterated twice before the third version was built for the API contest. One of the really cool new features he’s added is the ability to enhance our Wufoo export functionality via a [Firefox extension](http://csv2wufoo.com/exporter “CSV2Wufoo Firefox Extension”). 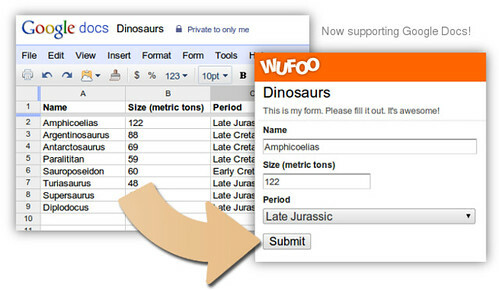 This plugin adds an additional button to the standard Wufoo Export dialog, allowing you to export your Wufoo form or report straight to Google Docs. When importing with CSV2Wufoo, you have your choice between three common formats: CSV, Excel, or Google Docs. Working with CSV or Excel is straight-forward: you supply the file, match the columns, and import. For Google Docs, you simply supply your credentials to the OAuth dialog and follow the same steps as a normal file upload. Very quick and very easy. CSV2Wufoo exemplifies the high standard of quality we expect of ourselves: clear documentation and design, excellent error handling, and a cohesive feature set without sprawl. We are always excited and proud to refer our users in need of import functionality and Google Docs integration to CSV2Wufoo and can’t wait to see what else Tim does with the app. Any integration plugin linking Wufoo and a CMS should do two things well: allow users to browse their Wufoo data easily, and help users integrate Wufoo forms into the content they publish. Wuphooey by Baylor Rae does both excellently and with lots of energy and style. There is a built in Entry Manager that allows you to browse all your forms as well as optionally show their Entry Count. From there you can click to view the entries of the form, then dig down into individual entries as well as add new entries. Adding a new entry is done by loading the form into the admin area itself. Baylor implemented smart features like credentials testing, smart caching with the ability clear the cache at all the right places, and links to edit your forms directly on Wufoo.com. He also went the extra mile by creating a [demo video](http://baylorrae.com/WuPhooey/) on installing and using the plugin as well. Congratulations winners! Because we were so blown away by the quality of everyone’s submissions, we’ve also decided to award free lifetime Bona Fide accounts to [all the contestants](http://www.wufoo.com/2010/09/17/the-api-contest-submissions/) for creating so much value to our users and helping us improve and test our new API. You guys all deserve it and we can’t wait to work with you on refining and getting the word out about your creations. Thanks again and happy form building! Whoooot! Thank you guys so much! I loved working with the new api. It was a blast and you just made it even more fun!!!! Posted September 21st, 2010 by Rick Blalock. Thanks guys! This was lots of fun. Congrats to all the winners. Posted September 21st, 2010 by Tim Morgan. This is just a mind blowing list of things that will seriously impact my work and the lives of many of my clients (and in turn their constituents). It’s just amazing. Congratulations to everyone involved and my deepest thanks as well. Posted September 21st, 2010 by Jason. Posted September 21st, 2010 by Kyle Robinson Young. Congratulations, Rick! The app looks awesome. Posted September 21st, 2010 by Matt Butcher. Thank you for the Wufoo progression! I will be purchasing this iphone app now, and using the wordpress plugin in 10 minutes! Posted September 21st, 2010 by Chais Meyer. Fantastic and suspenseful!!! Congrats to all. @Rick – post pics of that battle-axe in action! Posted September 21st, 2010 by Alan. Posted September 21st, 2010 by wufoo.com. Everyone needs a hug…..but I need a refund!! This is a show stopper for me and I suspect many of your users. I understand the real issue is Adobe v Apple however you really need to find a fix or at the very least consider highlighting this statement to unsuspecting users. This is a big disappointment for me and my first negative experience with Wufoo. Posted September 21st, 2010 by Cristian Ulloa. There are some really smart people out here… The iphone app is just awsome! I’ve only just discovered Wufoo and don’t know how i lived without it before. Its a shame Apple and Adobe just can’t hug and make up. Makes me laugh when surfing on iphone and a flash issue crops up with Adobe page subtly having a go at apple for not playing ball. Posted September 21st, 2010 by Andy Bocchetti.